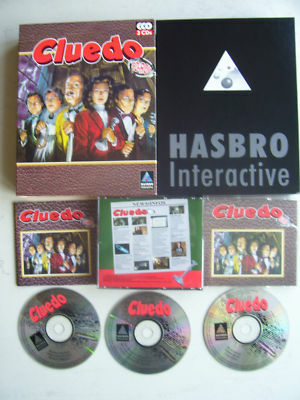 CLUEDO the classic detective game, is now presented in a exciting format! Arlington Hall looks better than ever, with Colonel Mustard, Miss Scarlett and all your favorite Cluedo characters. Now you can rummage through draws looking for clues, interview suspects, see dramatic flashbacks, plus much much more! It's said that certain precious stones are lucky, but good luck seemed to desert poor Mr Boddy. Has Mr Boddy really 'seen the light' Or is this just another of his cunning tricks? Just who is being blackmailed-and by whom? COMES WITH THE ORIGINAL BIG BOX PACKAGING!! !